Back in December, Transportation Security Administration officials caught some flack for forcing a couple of little old ladies at JFK airport to partially disrobe and show screeners their colostomy bags. Now, they'd like those two elderly grandmothers to know they're very sorry. Back in November, 89-year-old Ruth Sherman and 85-year-old Lenore Zimmerman each suffered humiliating treatment at the hands of TSA when they were strip searched at New York's JFK Airport. Zimmerman uses a walker to get around and was deemed enough of a security threat that she was separated from the herd and asked to remove her clothing for female security officials. 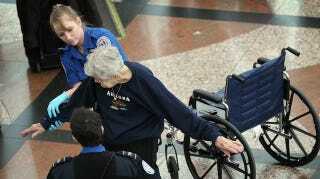 The wheelchair-bound Zimmerman was forced to show her colostomy bag and defibrillator to TSA employees. While a spokesperson for the agency admits that some of what happened to Zimmerman and Sherman was not okay, they still refuse to admit that either woman was strip searched. Thank goodness they were able to put a stop to all that terrorism those grandmas were planning on doing.